Using vinegar to kill weeds goes back generations when chemical herbicide products did not exist or were not widely available. Gardeners and homeowners used this versatile household product, which is a 5 percent solution of acetic acid. This mild acid burns through the protective coating on plants, causing them to die. You can also mix the vinegar with salt. The right ratio of vinegar to salt will help increase the weedkilling power of the vinegar. Control weeds in your lawn and garden with an organic vinegar and salt solution. Though vinegar will burn the tops of weeds, it doesn't inhibit the root system of the weed. For this reason, spraying the base of plants is the most effective method for killing weeds. Vinegar may not be effective on tougher, larger-leafed weeds, according to Iowa State University weed scientist Mike Owen. Vinegar for weed control is available at garden centers in a variety of concentrations such as 5, 10, 20 and 30 percent solutions. Use vinegar weedkillers on hot, sunny days to increase the burning effect on weeds. Salt is another old-fashioned method of weed control. People of previous generations poured the salt onto weeds, which burned the surface cell structures and caused them to dry out and die. Using salt in combination with vinegar was found to kill weeds more effectively, so vinegar-salt mixtures have become the preferred organic method. Unfortunately, salt permeates into the soil, making it an unhealthy growing environment for other plants, so use salt judiciously when applying to weeds. 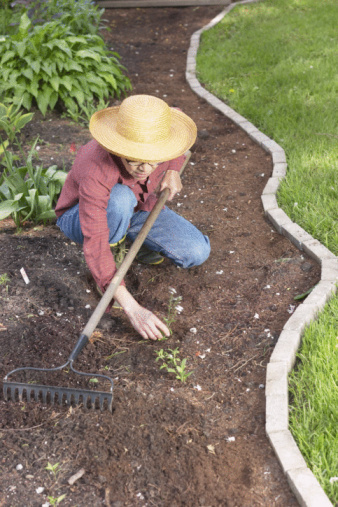 Cover only the weeds and use the minimum amount to prevent salt contamination of the soil. Add 1 lb. of salt to 1 gallon of 5 percent vinegar. Mix the two ingredients thoroughly until the salt dissolves. Add 1 tbsp. of dish detergent, which acts as a surfactant, breaking the surface tension of the water solution to cover the weed completely. Spray this mixture onto the plants or inject into the crown sections. Repeat after a few days for best results. Vinegar is a non-selective weedkiller that will damage any plant in the area surrounding the weeds. Apply the vinegar-salt weedkiller as carefully as possible and only onto the weed foliage you want to eliminate. Use gloves and eye protection when applying vinegar-salt solution to prevent irritation of skin and eyes, according to the website Fine Gardening. Wash your hands carefully after using the solution. What Is the Formula for Mixing Up Vinegar, Salt Water & Dish Soap for Use as a Weed Killer?